Kona Reef Hawaii is what Hawaiian vacations are all about--a luxurious, ocean-side setting with the finest weather of all the islands; close to sports activities, unique history, and great shopping; one of the best luaus in the islands; and other adventures for the entire family. 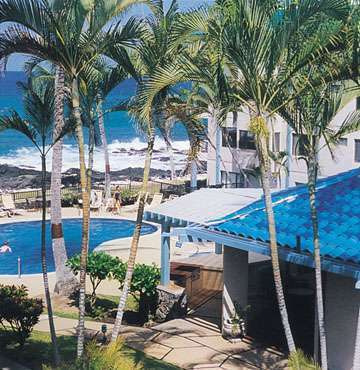 Located in the charming ocean-side village of Kailua-Kona, the Kona Reef offers a traditional Hawaiian ambiance in a relaxed, comfortable setting. The resort is convenient to an array of shopping, dining, and entertainment. Just steps from the water, most suites offer breathtaking ocean views from spacious lanais, along with the soothing sound of waves lapping at the shoreline.